With our increasingly hectic lives, winning attendees means winning hearts and minds – that’s why telling a story is becoming a bigger focus for savvy event marketers. In Eventbrite’s 2018 Pulse Report, we discovered that organisers’ aspirations have changed from simply hosting events, to creating on-going narratives. One-third of those we surveyed said the key reason they now organise events is to bring people together, uniting them in a common interest. To achieve this unification, a great content marketing strategy is of utmost importance and more event planners are investing in this area than ever before. The Pulse Report found that 46% of companies hiring in 2018 are looking to take on people with communications and marketing experience. In light of this trend, we spoke to 7 organisers who have put creating content at the centre of their event marketing. Find out how they use a range of mediums and platforms to tell stories that drive interest, anticipation and participation throughout the lifecycle of their events. “When Spin Master asked rEvolution to organise the PAW Patrol Road Patrol Tour we wanted to do all we could to precisely reach our target audience for little to no cost. We knew that reaching mommy bloggers was a way to get guaranteed reach and engagement. “We asked them to share tour stop and pre-registration information and run contests on their blogs and social media to win toy packages. As a thank you for the partnerships, we also provided participating mommy bloggers with a prize pack for their kids. This outreach resulted in 88.62 million total impressions. “The PR team then put a capstone on the campaign by securing a spot on The Ellen Show. We knew that Ellen could be an ideal fit because it attracts an audience of young moms, but we had to find a way to authentically associate the two. 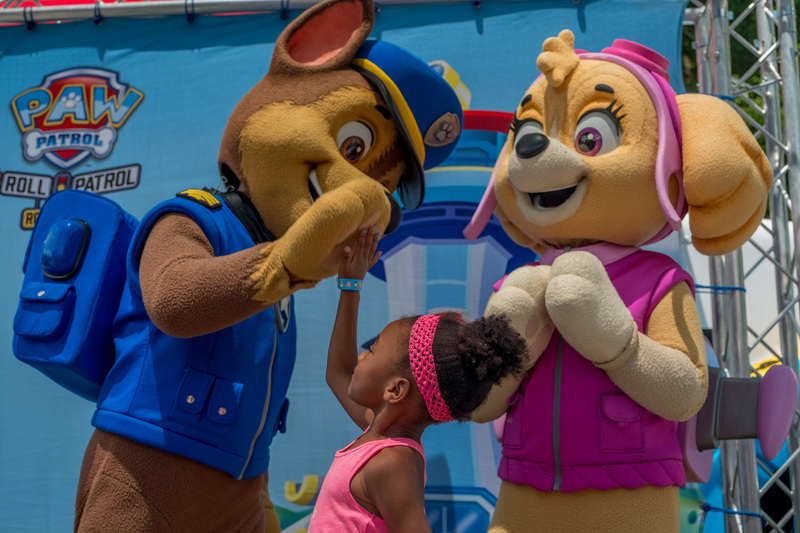 “We quickly realised that five-year-old kid genius and regular show guest Brielle could be a perfect catalyst given her love of everything PAW Patrol. We approached the show about featuring Brielle at an LA tour stop. After much planning and syncing schedules, we decided to create a separate activation for the Ellen shoot, where Brielle went on a scavenger hunt with the PAW Patrol pups. The digital piece lived on EllenTube and YouTube and was also featured on the broadcast episode of the show with Brielle in studio talking about her experience. “The Vamps worked with Landmrk’s mixed reality platform to promote their 13-date UK Night & Day tour. On the day of each show, we created hotspots in the city or town the band were playing in, allowing fans to access exclusive content and prizes. “On the day of the show, fans were able to win prizes, including a place on the guest list, by visiting hotspots which they could find through a The Vamps branded map on a dedicated website. People that visited the most hotspots in their town could win the best prizes but all fans that visited the hotspots were rewarded with messages from the band. At each hotspot, fans could share their wins or progress through their chosen social media platform. “On the night of the gigs, every fan that attended a show was rewarded for their loyalty with selfie filters, offering them a keepsake of the gig. These photos were graded, branded and personalised with the venue and date, and were only available to fans at the show on that night. “We focus on creating visual content, such as videos, to really bring the spirit of Freshers Festival to life for students and the brands that get involved. Recently, for example, we created a video marketing campaign to showcase the festivals in Glasgow and London to potential fashion and beauty brands. “We like to emphasise the universal student experience in our content. Students have a lot of fun interacting with the event features, exhibitors and each other at Freshers Festival. Attendees and brands get to join together under one roof and create authentic experiences and we love to capture that in a way that does it justice – video allows us to do that. “In the build-up to last year’s Buy Art Fair in Manchester, we focused heavily on sharing images of the art that would be available to purchase at the fair on social media. Sharing images daily, with frequency increasing the closer we got to the opening date of the event, meant we were able to promote the widest range of work possible – across all mediums, styles and price points. “People could interact with and share the pieces which really spoke to them, therefore extending our reach and massively upping engagement pre-fair. This, in turn, had a positive effect on ticket sales and sales of art. Many visitors came specifically to purchase work they had seen beforehand on social media. “We’ve been promoting our first marketing event in Dublin on social media and by email. But we’ve found that it’s our offline marketing that is creating a real buzz. We created a leaflet that we’ve distributed through local co-working spaces, as well as the offices of other marketing companies and some of our bigger customers who have large marketing teams. “The leaflets only cover the simple what, where and when of the event, so we think this is piquing people’s curiosity and driving them to find out more. We’ve included branded links, which have helped drive traffic to our event page. We’re able to track the number of people typing the URL into their browsers and have been surprised by the traction it has had. “We plan to take full advantage of this for future events and are planning to try handouts with QR codes and, perhaps, leaflets with just a CTA for marketers and the link to see if this mysterious messaging will drive more people to our event page. “We organised a one-day event to teach business owners how to create a story for their brand and gain media attention. We kicked off marketing with a “your reason why” campaign, communicating why they should want to be there. This included mini teaser videos and a pre-event live webinar with local influencers on the need for media attention to build your brand. “We ensured a consistent social media presence by enlisting both our three-person team and our speakers to develop content. We also partnered with a TV station and a popular weekly paper to co-brand with them. As invested partners, they had an interest to hype up the event. “We did a little traditional media (paid posts, retargeting ads etc.) but focused on building a story around the individual person and how we could help them solve their problem with attracting media brand attention by giving them the tools to DIY media. “The event was themed “red carpet rebels” and we wanted to encourage each attendee to share their own story. We welcomed them with a full red carpet production, including “paparazzi” to have them feel engaged and like VIPs as they entered the door. Post-event they were able to access these photos and share them. “J’adore Detroit is a lifestyle and culture blog surrounding all things Detroit. We also host live events. Instagram is a really important promotional tool for us and, leading up to an event, I make sure that around three live stories a week are posted with easily accessible swipe-ups, allowing users to find out further information about the event. “Once the event is here, I love live-streaming it from our Instagram page. Even if our followers can’t make it, they feel as if they are there with us. They can see the event from our point-of-view and, if they see how much fun we’re having, they’re more likely to want to go to the next event we organise. Authentic content can help you start a dialogue with your audience before the doors to your event even open. Using all the mediums at your disposal to give your story as much colour and depth as possible will enable you to continually ramp up excitement – and drive ticket sales. For tons more event promotion ideas, check out what other event planners are up to on the EventTribe forum.